Well, you asked and Valve listened. The Steam app for Android is now open to everyone with a Steam account, so you can download it and start chatting it up with your buddies on your phone. The app is still under construction in some areas but I get the feeling that this will be getting frequent updates to fix all the problems. In a bit of “I am not surprised” news, it seems that any apps offering the Steam functionality that were not licensed by Valve have been disappearing from the Market. Steam actually had an API available to the public so that they could make apps if they pleased, and there were a few pretty decent ones. 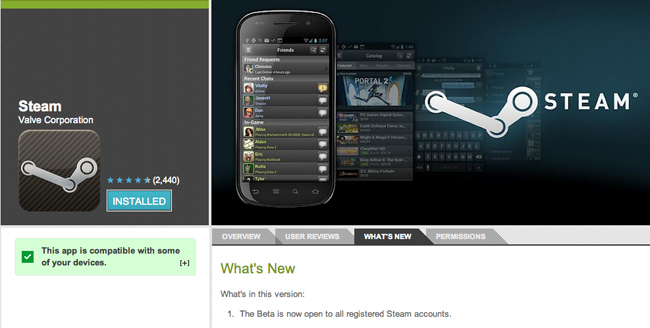 However it seems that now Valve is in the game officially they would like you to kindly use theirs.